Woke up at 9:30 AM and by 10:30 I was walking back over to Forex to change some more money (since I paid for dinner last night and those phone cards). I checked in with Simon at the Orange store to find out how to check the amount of money still left on the phone (you dial *100#). I shopped on the street and bought a polo shirt and some underwear (only brought 3) and then had a cappuccino at Siegfried's again and did a crossword. I found a store that had a sale on sports jackets and bought this brown suede looking thing as well as two more polo shirts. I also bought a soft Eis (ice cream) cone but only finished half of it even thought it was very good. On the way back to the hotel at 12:30, I saw what looked like a modern computer video game place but when I got inside I saw they had modern internet facilities set up. I had the disk in my pocket so I asked how much and he told me it was only 20 Kr so I went online and did my email and sent out Diario #3. 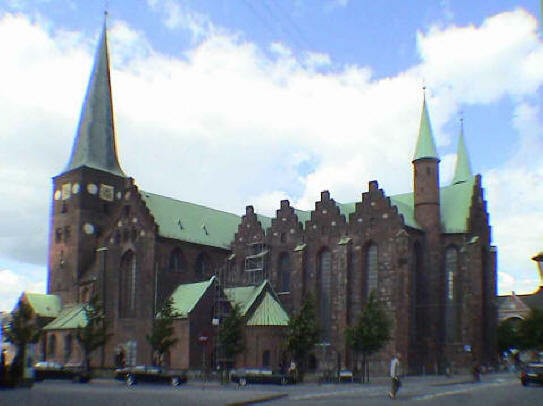 At 1:30 we checked out of the hotel and then walked together over to the center of town to see their famous Domkirke (Duomo or cathedral). It was quite impressive. 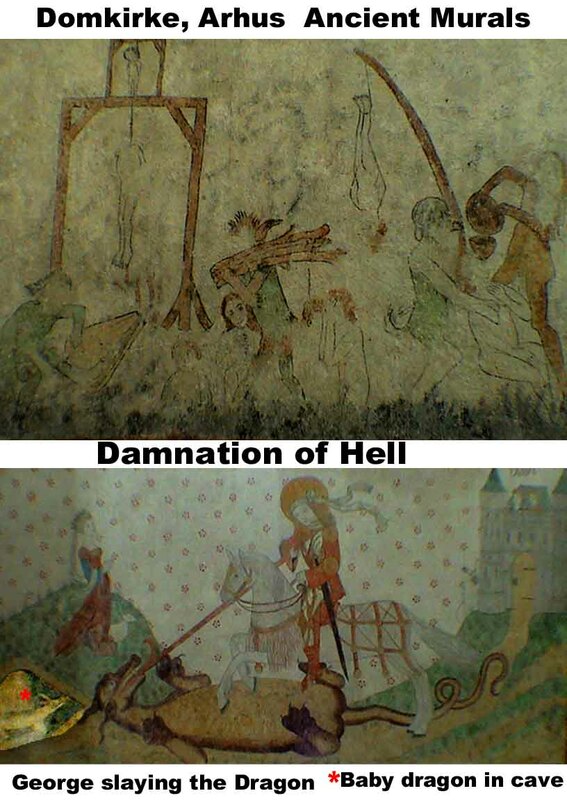 It was begun in the 1100s and they painted murals on the walls to instruct the illiterate with scenes of damnation, etc. 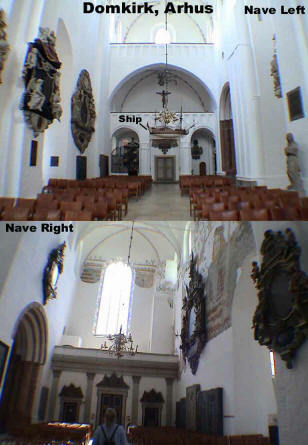 After the Reformation, they whitewashed them all over. 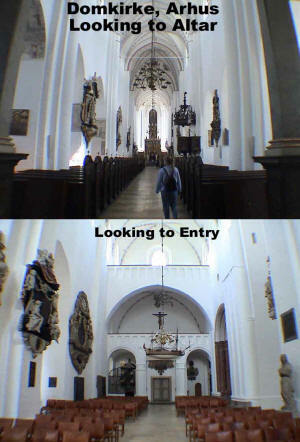 It was only recently that they uncovered them and have preserved what was salvageable. The most famous is George slaying the dragon, with the warning that there is a baby dragon there in the cave to get him at a later day. We went into a side room that appeared to have a portrait of all the bishops of the church. 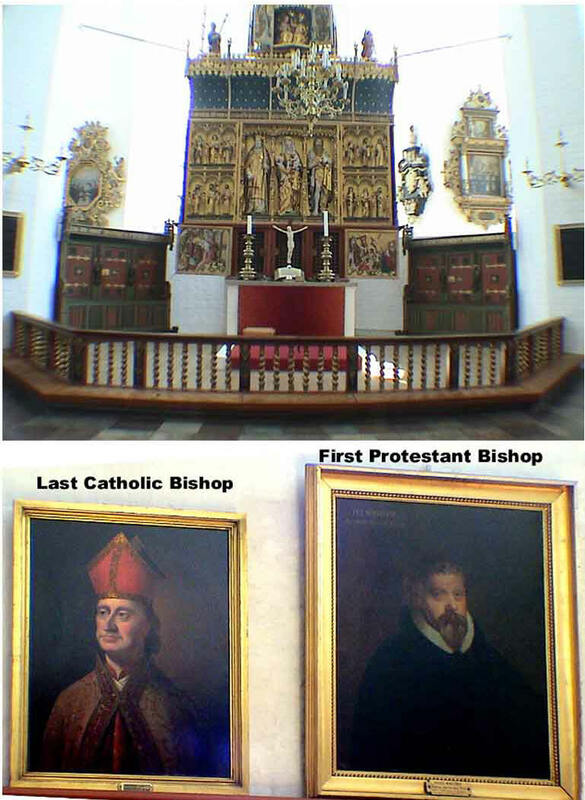 A man cleaning up pointed to the portrait of the last Roman Catholic bishop and the one of the first Protestant bishop after the Reformation. It appears the red hat went to the funny frilled white collar. These are pretty old portraits. 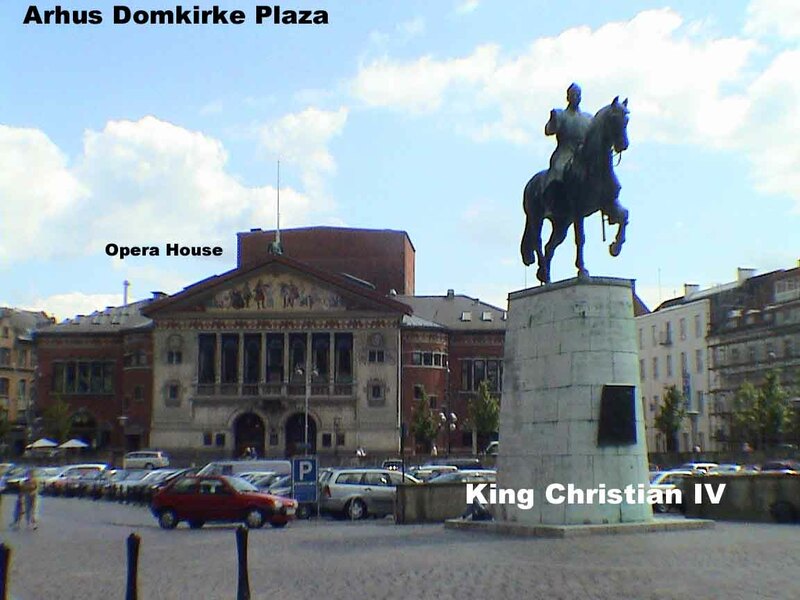 The plaza near the Domkirke is impressive with a large equestrian statue of King Christian IV right near the main opera house. By 2:30, Marcia had lunch at Café Viggo [, +45-] back on Åboulevarden and I joined her for a cappuccino. At 3:30, we finally took off for our next destination, SWEDEN.